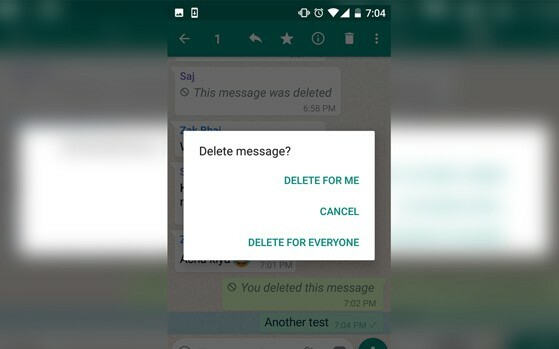 WhatsApp’s ‘Delete for Everyone’ feature is now on your smartphone..
WhatsApp’s new feature is up and rolling. Many WhatsApp users are getting a ‘Message was deleted’ text from their friends. This is just your friend trying the new ‘Delete for Everyone’ feature. The feature was pushed out to the stable-build last week but has finally roll-out to devices in India. The new feature will be able to delete sent messages. However, the receiver will still see a message stating, “this message has been deleted” for Android users and “this message has been recalled” for iOS users. Lately, the application launched various features that put it in competition with major sharing platforms like Snapchat and even Instagram. The instant messaging application also launched a new ‘live locations’ feature which is rolling out for users across iOS and Android. Now, the company has also introduced a feature that has been long in the waiting. WhatsApp is finally pushing out the ‘Delete for Everyone‘ feature with the stable build of the device. The update will be available for Android, iOS and Windows Phone operating system. This new feature can prove to be day saver for many since the WhatsApp is become the hub of both personal and professional communication. Ever come across a situation where you’ve sent the wrong message to the wrong person? This is where this new feature will help. WhatsApp has become the go-to application for all communication, be it personal or professional. With such blurred lines in between it’s easy to mix up names and occasionally send an inappropriate text to someone who was not supposed to receive it. Using this feature the sender can tap of the erroneous message and select the ‘delete for everyone’ feature. This will delete the text on the receiver’s device. However, there are terms and conditions attached to this. The message can only be deleted within seven minutes after being sent. Quoted WhatsApp texts cannot be deleted even within seven minutes. Another major condition will be that the receiver’s WhatsApp application should be up to date. The feature will not function with an older version on either end. WhatsApp on Symbian operating system will also not be able to get this new update. This new feature will reach most devices gradually. However, iOS users might start receiving it earlier than others. WhatsApp has been aggressively introducing new features within their application and is also stepping in the social media realm by introducing features like stories. The consistent rise in a smartphone’s computational power is enabling applications like WhatsApp to delve into other genres of communication. Though many popular applications offer services like conference video and voice calls much before WhatsApp, the sheer size of the user-base makes the feature an instant hit. The application has 1 billion daily active users and around 1.3 billion monthly active users. The Live Location feature was also offered by various applications like Messenger, Google Maps, Telegram etc. but with WhatsApp adopting it, the feature might finally get a broader audience. WhatsApp has easily become the most widely-used app on Google’s Play Store as well as iOS’ App Store. The application boasts over a billion downloads on Play Store alone. The company also released a few statistics claiming around 1 billion active users daily and over 1.3 billion monthly active users.